This is a scalable context timeline. It contains events related to the event May 22 to August 2000: Al-Qaeda Hamburg Cell Member El Motassadeq Attends Afghan Training Camp. You can narrow or broaden the context of this timeline by adjusting the zoom level. The lower the scale, the more relevant the items on average will be, while the higher the scale, the less relevant the items, on average, will be. 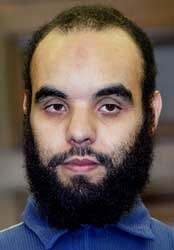 Mamoun Darkazanli several years after 9/11. [Source: Reuters]According to CIA documents, US intelligence first becomes aware of Mamoun Darkazanli at this time, when a person arrested in Africa carrying false passports and counterfeit money is found with Darkazanli’s telephone number. Darkazanli is a Syrian businessman residing in Germany. The CIA carefully scrutinizes Darkazanli and his business dealings, but authorities are not able to make a case against him. [US Congress, 7/24/2003, pp. 185 ] Many will later claim that Darkazanli is a member of the Hamburg al-Qaeda cell. He will associate with 9/11 hijackers Mohamed Atta, Marwan Alshehhi, and others (see October 9, 1999). Zakariya Essabar. [Source: Associated Press]Al-Qaeda Hamburg cell member Zakariya Essabar attends an al-Qaeda training camp near Kandahar, Afghanistan. He leaves for the camp in January 2000 and stays at the camp for an usually long time—nine months—until October. 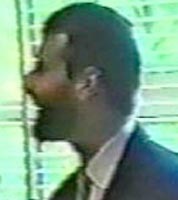 Hamburg cell member Mounir El Motassadeq is at the same camp from late May until August 2000 (see May 22 to August 2000). The two of them train separately but see each other often. Hamburg associate Abdelghani Mzoudi also attends the same camp around this time (see Summer 2000). Al-Qaeda Hamburg cell member Mounir El Motassadeq attends an al-Qaeda training camp near Kandahar, Afghanistan. He leaves on May 22, 2000, flying from Hamburg, Germany, to Istanbul, Turkey, and then on to Pakistan. 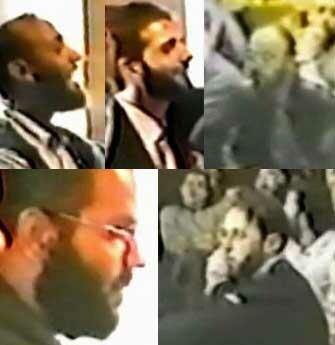 He is there at the same time as another Hamburg cell member, Zakariya Essabar (see January-October 2000). Although they train separately, they are at the same camp and see each other frequently. [McDermott, 2005, pp. 194, 201-202] Hamburg associate Abdelghani Mzoudi also attends the same camp around this time, and El Motassadeq will later testify in court that he meets with him at the camp. (see Summer 2000). El Motassadeq leaves Afghanistan in August 2000. [Los Angeles Times, 8/30/2002] El Motassadeq’s trip to the camp is likely noticed by the Turkish government, because he is on a watch list and he uses a known route to the camps (see May 22, 2000). Alleged al-Qaeda Hamburg cell member Abdelghani Mzoudi attends an al-Qaeda training camp. Mzoudi has long been an associate of future 9/11 hijacker Mohamed Atta and others in the Hamburg cell. In the summer of 2002, a witness will tell German intelligence that Mzoudi was seen at one of the al-Qaeda training camps in Afghanistan. Mounir El Motassadeq, a member of the Hamburg cell, will later testify in a German court that he met Mzoudi in Afghanistan (see May 22 to August 2000). Their mutual acquaintance Zakariya Essabar is at the same camp as El Motassadeq at this time (see January-October 2000). [Associated Press, 5/9/2003] Mzoudi will later be convicted of a role in the 9/11 attacks, but will then be acquitted after the US does not allow a key witness in its custody to be questioned (see February 5, 2004-June 8, 2005). The German government issues international arrest warrants for Ramzi bin al-Shibh and Said Bahaji, two members of the al-Qaeda cell in Hamburg, Germany, along with a few of the 9/11 hijackers. Bin al-Shibh was last seen in a Hamburg mosque in August 2001. Bahaji left Germany for Pakistan on September 3, and bin al-Shibh did the same on September 5 (see September 3-5, 2001). [Knight Ridder, 9/21/2001] Bin al-Shibh will be captured in Pakistan in September 2002 (see September 11, 2002). There will be no reports that Bahaji is ever captured or killed. The German government arrests Mounir El Motassadeq in Hamburg on the “urgent suspicion of supporting a terrorist group.” El Motassadeq, a Moroccan student, is believed to be part of al-Qaeda’s Hamburg cell, along with a few of the 9/11 hijackers. After 9/11, he did not attempt to leave Germany, and he was under surveillance for weeks before his arrest. He fell under suspicion when investigators discovered that he had power of attorney over a bank account in the name of 9/11 hijacker Marwan Alshehhi. [Washington Post, 11/29/2001] El Motassadeq will be charged with a role in the 9/11 plot in late 2002 (see August 29, 2002). He will be convicted in 2003 (see February 18, 2003). Ramzi Bin al-Shibh, a Yemeni. He is considered the head of the 9/11 plot in Germany while the hijackers were living in the US. He was captured in Pakistan in 2002 and put in the secret CIA prison system (see September 11, 2002). Mounir El Motassadeq, a Moroccan. He knew the others in the Hamburg cell and trained in Afghanistan (see May 22 to August 2000). He has been arrested and charged with a role in the 9/11 plot. He will later be convicted (see January 8, 2007). Abdelghani Mzoudi, a Moroccan. Mzoudi lived with Mohamed Atta and others in the Hamburg cell, and he is alleged to have attended a training camp in Afghanistan in 2000 (see Summer 2000). He has been arrested in Germany and charged with a role in the 9/11 attacks. He will later be acquitted after the US fails to cooperate with German prosecutors (see February 5, 2004-June 8, 2005). Barakat Yarkas, a Spaniard. He is alleged to be the leader of al-Qaeda in Spain. Germans believe he helped arrange a meeting between Atta and bin al-Shibh in Spain two months before 9/11 (see July 8-19, 2001). He is imprisoned in Spain on various terrorism charges. He will later be convicted to 12 years in prison, but not for any role in 9/11 (see September 26, 2005). Mohammed Haydar Zammar, a Moroccan. He was investigated for al-Qaeda ties for years prior to 9/11. He was captured in Morocco after 9/11 and renditioned to a prison in Syria (see December 2001). Said Bahaji, a German. He is said to be a computer expert who taught Atta and others how to use computers to communicate. He fled Germany just before 9/11 (see September 3-5, 2001). There is a warrant for his arrest (see September 21, 2001), but he remains free. Zakariya Essabar, a Moroccan. He lived with Atta, Bahaji, and others. He trained in Afghanistan and attempted to get a US visa (see January-October 2000). He fled Germany just before 9/11 (see Late August 2001). There is a warrant for his arrest (see October 19, 2001), but he remains free overseas. Mamoun Darkazanli, a Syrian. He had been investigated for al-Qaeda ties for years before 9/11 (see 1993), and he knew Atta, Marwan Alshehhi, and other members of the Hamburg cell (see October 9, 1999). He remains free in Germany (see November 11, 2010). More than Just Nine - But a few months later, the Chicago Tribune will report that investigators believe there are many more members of the Hamburg cell than was previously reported (see February 25, 2003). For instance, one likely participant who will only become publicly known many years later is Naamen Meziche. He was friends with Atta and others in the Hamburg cell, and he will be killed by a US drone strike in Pakistan in 2010 (see October 5, 2010). Mounir El Motassadeq is convicted in Germany of belonging to a terrorist organization and sentenced to seven years in prison. However, he is acquitted of involvement in the 9/11 plot. He had previously been convicted of such involvement (see February 18, 2003), only to have the ruling overturned later (see March 3, 2004). The verdict was overturned when a judge ruled he was unfairly denied testimony for al-Qaeda suspects in US custody such as Ramzi bin al-Shibh. For the retrial, the US provided summaries from the interrogation of bin al-Shibh and other suspects, but did not make full reports available to the court or allow the prisoners to appear in person for cross-examination. The judge presiding over the retrial criticized the US for failing to give more evidence, saying, “How are we supposed to do justice to our task when important documents are withheld from us?” [Associated Press, 8/19/2005] A former roommate of El Motassadeq testified that Mohamed Atta and bin al-Shibh regularly visited El Motassadeq, and he once overheard him say: “We are going to something big. He said, ‘The Jews will burn; we will dance on their graves.’” [Associated Press, 6/5/2005] However, a 9/11 Commission investigator gave testimony that was very damaging to the prosecution’s argument that the Hamburg cell had a significant role in preparing the plot while in Germany (see March 8, 2005).